I’ve been waiting to update my previous post for some good concrete political news from Italialand. There’s finally news, but is it good? is it concrete? This long period without a government is like purgatory, living under the limbo bar, suspended animation, like traveling where you never seem to arrive but spend every day in waiting rooms watching the clock. Or like walking on ice, unsteady, sure to fall, to break thru and drown and freeze at the same time. Okay, you get it. Remember the 30% x 3 + 10 split that came out of the last elections? Since the anarchistic 5 Star Movement seems unwilling to even speak to any of the others, that leaves 30 + 10, left and center, which is not enough, or the dreaded 30 + 30, the left and right together to form the government. The insane election law prevents new elections from changing the equilibrium, so that’s not a realistic option, although all parties threaten: If you don’t do as I say, we’ll call new elections and that’ll teach you! 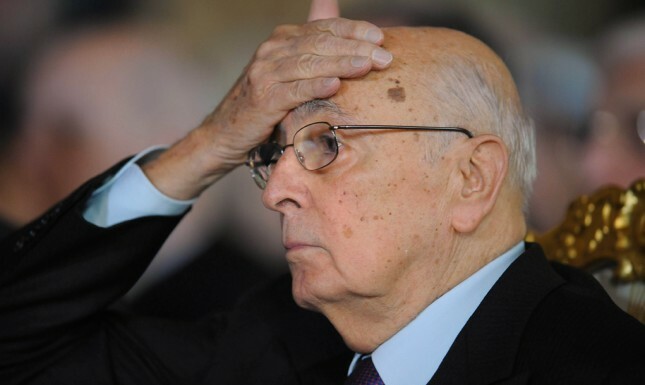 Our 88-year-old president, Giorgio Napolitano, a true blessing for the country, was re-elected for a second seven-year term in a desperate attempt to impose a compromise. It might work. It’s full of traps and paradoxes. The left-wing leader, Nichi Vendola, is right when he says that the same people who created the problems can’t fix them. Napolitano is also right when he says that there’s no alternative. 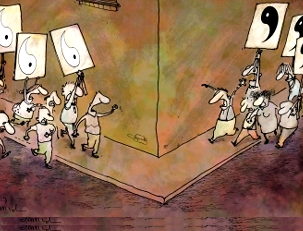 So every group gets the in-or-out call (out is lots easier), and those who are in have to form a coalition with their worst enemies. That is tough to stomach. So, go figure, the Democrats self-immolated in parliament (because all the leaders hate each other’s guts) and the odd one-man Right Wing seems almost saintly now. People can’t remember that, apart from the Monti technical government, the rulers who caused the current crisis are the ones who are protesting the loudest against it now. Berlusconi says the country’s gone down the shithole, as if he wasn’t shoving it there himself for nearly twenty years. Oh, I forgot, he also paid some senators 3 million euros each (30 pieces of silver, adjusted for inflation) to vote against their democratic Prodi government and bring its downfall, so he could slither back to the top. “Money can’t buy me love.” As if. Is it in the definition of politics to make pacts with the devil? Enrico Letta, Mr. Clean, is working out the details as we speak. What will be the final cost for us? Nobody knows. What I want to know is if someone can turn things around before I have to sell my house. Because, while politics may be Italy’s favorite game, it’s connection to people’s real lives is finally becoming clear: a million new unemployed last year, a thousand businesses close every day, 50% youth unemployment. We’re spending our life savings to pay the grocery bill. Welcome to a worser world. Mutt: Question: Why do supermarkets make the sick walk all the way to the back of the store to get their prescriptions while healthy people can buy cigarettes at the front? Jeff: I’m answering a question with a question: Why do banks leave vault doors open and then chain the pens to the counters? Mutt: Why do we leave cars worth thousands of dollars in our driveways and put our useless junk in the garage? Jeff: Why does the sun lighten our hair, but darken our skin? Mutt: Why is it that doctors and attorneys call what they do 'practice'? Jeff: Why is the man who invests all your money called a broker? Mutt: Why is the time of day with the slowest traffic called rush hour? Jeff: Why isn't there mouse-flavored cat food? Mutt: Why didn't Noah swat those two mosquitoes? Mutt: If flying is so safe, why do they call the airport the terminal? Jeff: Why don't you ever see the headline 'Psychic Wins Lottery'? Jeff: About twenty too many. Mutt: You’re moaning today, but you’ll be re-telling them tomorrow.